I’m speaking today about “The Evolution of Active Directory Recovery” at TechEd 2012 US (SIA319, 1pm in Hall N310). The session will also be streamed. I’ll be taking questions using Twitter. If you are in the audience (in the hall or online) and you have any questions, just twitter them using the hashtag #TESIA319 – this enables me to follow up with the answers either in the session, or if we are short on time or have to many sessions I’m following up afterwards. This also enables attendees who are not sitting close to a Microphone, who are watching the streamed version or who feel more comfortable writing than speaking to ask their questions. Two simple rules: use the #TESIA319 hashtag – I will not monitor anything else during the session, and please ask questions in the areas I’ve covered, so that we can try avoiding to have questions which are covered in the next slides. Looking forward to the session and hopefully seeing you there! 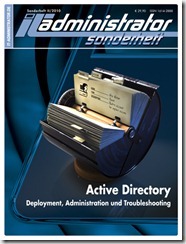 MVP Florian Frommherz and I wrote a Special Edition of the IT-Administrator: almost 180 pages which provide in-depth information about Active Directory. We are discussing the Evolution of AD, Domain and Forest Strategies, Understanding the Domain/Forest Levels, LDAP Backgrounds and Application Performance testing, AD and DNS, AD Backup and Recovery, Background Information about the AD Recycle Bin, Virtualization of DCs, Replication Across Firewalls, RODCs, Delegation and MSAs, Fine Grained Password Policies and many more. We are very happy with the result: a huge amount of in-depth information for any AD Admin or Consultant. Sorry – just in German for now. But an interesting read. If you got it, feel free to provide feedback! Win7 will be available in stores Oktober 22nd, R2 on September 14th. The pre-order of Win7 is already running for a couple weeks. Windows 7 will only be available in English on the Dates above, additional languages will follow early October. WS08R2 will be available in a couple languages such as English, German, Spanish,… and additional languages will be made available later in September. I’m very excited to get the final version of both products, I’ve loved and used them in Production using the Release Candidate and can’t wait to install the final version instead! Congrats Microsoft!!! What a release!